May is the month when many flowers finally go into full bloom after a long winter's sleep. For the blog hop this month we want to see your favorite take on flowers. You can stamp backgrounds, create custom floral embellishments, showcase unique flower center additions (buttons, rhinestones, beads, etc...), flowers die-cut from different materials (like fabric, felt, vellum, etc...) or anything else you can dream up! We are looking forward to seeing all of your amazing creations! I think the papers from the October Afternoon Modern Homemaker paper pad work well with the flowers in the jar. And the tiny tag tied around the jar with rustic jute was the perfect finishing touch. I love these tiny tags. Thanks for looking! Now check out the rest of the Blog Hop participants on the list over at Nichole's blog. Have a great Blog Hop day! Linda, this is gorgeous! I love the overall design of your card. Beautiful! Gorgeous card -- love all the details!!! There were so many different PTI sets to use for this. 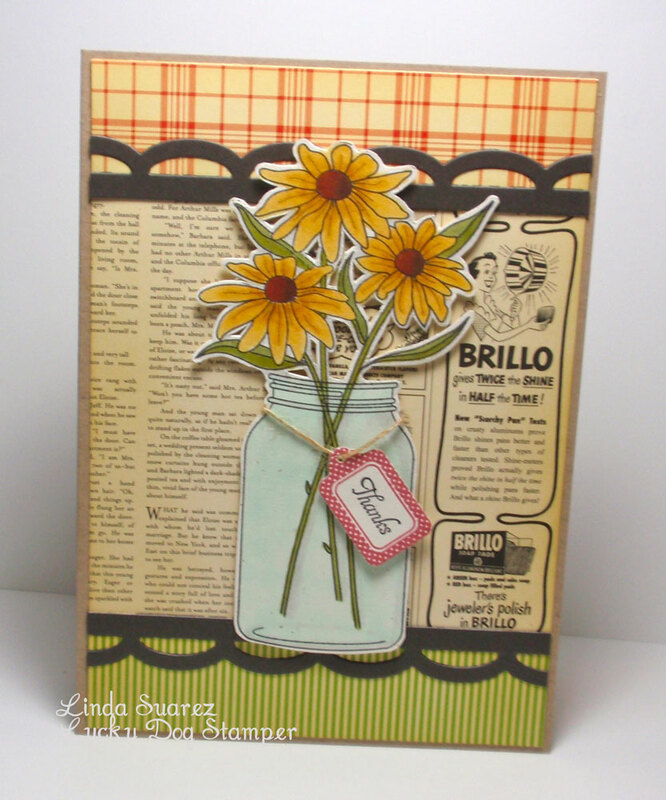 I love the daisies and the homespun feel to your card. Very pretty! love those flowers on top of that patterned paper, just makes my day!!! This is lovely. I love the look of it..vintage and soothing. Isn't that cute! You did a FABULOUS job of cutting out all that detail! This is lovely! Great use of patterned paper and I just adore that stamp set! This is brillo brilliant!! Love the vintage look with this paper and gorgeous coloring in the flowers! Very nice! Oh my stars, those papers look perfect with the jar image, Linda! So do the border die cuts for that matter! Terrific! Really nice card, I love the daisies and your accent papers are perfect. Great job! One of my favorite sets. Love those papers with it. Love this card Linda! You always do such a great job! Oh, I love the Daisies! Wonderful coloring. Don't you love Friendship Jar? I can't wait to get the Christmas fillers...! TFS! one of my fave stamp sets! beautiful card! Very nice! Love all the different elements. The friendship jar is one of my faves so of course I LOVE this card! Great job on the flowers! 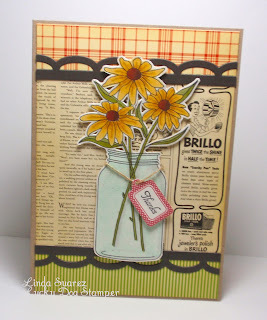 I love the jar on top of the patterned paper - such a happy card! beautiful coloring. I like the twin holding the tag. That filler is on my wish list. I love everything about this card and the lovely color palette in particular! Beautiful card Linda! You have such a wonderful way of putting cards together! Beautiful Card. I love the colors and paper that you chose to pair with the image. Very nice. I love the coloring on the flowers. those papers are fabby for this! I love this set, and your card is so lovely! Beau-ti-ful!! I like how you tied the tiny tags around, it adds such a fun element to it. The colouring job is fabulous too! Love the papers with your flowers! Great combo! TFS! Great combination of papers, colours and stamping. The background papers have such a vintage feel and the daisies are so reminiscent of a warm summer day. Wonderful card! I love the colors and layout. Your coloring is perfect! Gorgeous card, love the florals and your choice of the papers is perfect! Thanks for the Memories, Dad.